Skinny Single 69 x 200cm / 2'3" x 6'6"
Small Single 76 x 191cm / 2'6" x 6'3"
Small Single 76 x 200cm / 2'6" x 6'6"
European Small Single 80 x 200cm / 2ft 7.5 x 6ft 6"
UK Single 92 x 191cm / 3' x 6'3"
Long Single 90 x 200cm / 3' x 6'6"
Metric Single 100 x 200cm / 3'3" x 6'6"
Large Single 107 x 200cm / 3'6" x 6'6"
Small Double 122 x 191cm / 4ft x 6'3"
Long Small Double - 122 x 200cm / 4ft x 6'6"
UK Double Bed 137 x 191cm / 4'6" x 6'3"
UK King 153 x 200cm / 5' x 6'6"
European King 160 x 200cm / 5'3" x 6'6"
Small Super King 170 x 200cm / 5'6" x 6'6"
UK Super King 183 x 200cm / 6' x 6'6"
Emperor 200 x 200cm / 6'6" x 6'6"
Emperor 200 x 215cm / 7' x 6'6"
UK Single 3' x 6'3"
UK Double - 4'6" x 6'3"
UK King - 5' x 6'6"
UK Super King - 6' x 6'6"
UK Double - 4'6 x 6'3"
UK Manufactured bed sheets in luxury 200, 400 & 1000 thread counts. We make to fit standard and bespoke sizes from 2ft 6in all the way up to Emperor & Caesar sizes. If you cant find your size please contact us, we will be happy to provide a quote. UK Manufactured Plain & Patterned Duvet Sets in a massive range of colours and fabrics. UK Single - 3' x 6'3"
Protect yourself and your mattress from spills, dirt & allergens with our superior protectors. Available in Quilted and TENCEL fabrics. All our mattress protectors are breathable for extra comfort. 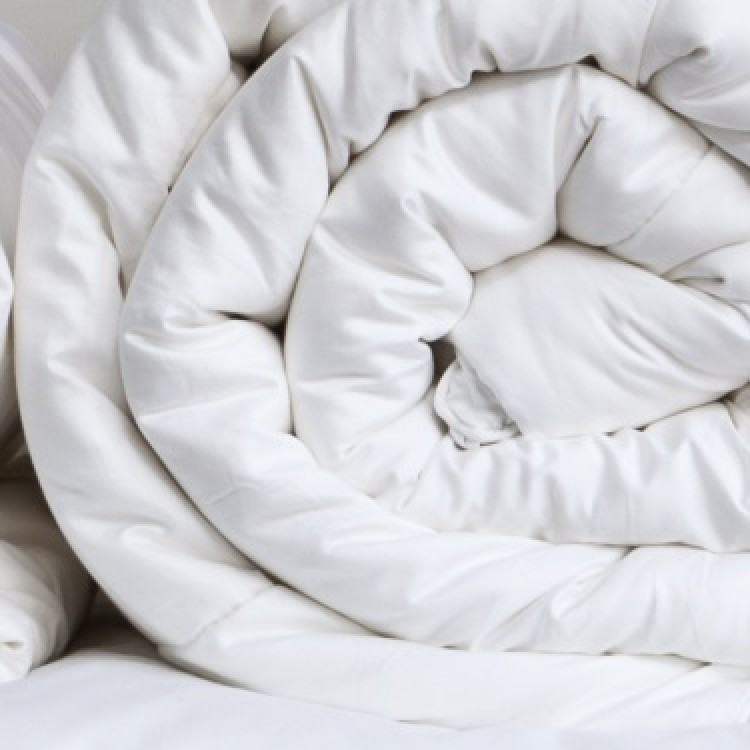 Available in standard and bespoke sizes we have duvets in high quality Hollow Fibre Dacron Comforel or luxury natural fillings such as 85/15 Duck Feather & Down or 90% Goose Down. Super King - 6' x 6'6"
Valance and bed frills made to fit any size of bed. We manufacture each valance to the frill drop or mattress depth required so its fits beautifully. Emperor is an extra large size of bed that has become more and more popular over the last few years. Larger than a standard super king bed most emperor beds fall into the 6'6" x 6'6"or large Emperor 7' x 7' sizes. Bedding for this size and especially duvets can be hard to find. Victoria Linen stock a 115" x 95" (292 x 233cm) emperor size duvet that is ideal for these larger beds. Our collection of duvets are UK manufactured duvet and come in Hollow Fibre, Duck Feather & Down or Goose Down fillings. We have items to keep you warm in winter and cool in summer and you can find different tog options for each of our products. If you can't find the type of duvet you need in our shop, even after using the search function, we may be able to source it. Please call 01706 220020 or contact us for a quoted price. Keep visiting our site as we have regular special offers. Emperor Duvet in Luxury 100% Siberian Goose DownSize : 115" x 92" (290 x 235cm)The incredibly ..
Emperor Duvet Duvet perfect for 6ft 6" and 7ft beds in duck feather & downEmperor and large emp..
Emperor Duvet in Goose DownGoose Down Duvet to fit 6ft 6in and 7ft beds.Extra large duvet to fit 200..
Emperor DuvetLarge duvet ideal for 6ft 6in and 7ft beds.Larger beds such as emperor and large empero..
Luxurious Emperor duvet filled with 100% Mulberry Silk320 x 235cm (115" x 92") DuvetRelax in an ultr..
Duvets : Everything You Need To Know. Why Buy a Deeper Mattress?